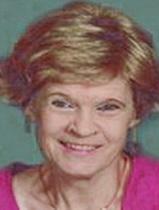 WATERLOO - Bonnie J. Blankenfeld, 57, of Waterloo, died Tuesday, March 31, 2009, at Covenant Medical Center. She was born June 7, 1951, in Hustiford, Wis., daughter of Wilbert and Angeline Ahrens Mueller. She married Peter Blankenfeld on July 31, 1971, in Chicago. Mrs. Blankenfeld was employed by several restaurants, including Shakey's Buffet and McDonald's. She most recently was employed with Sam's Club. Survived by her husband; a son, Michael (Ashley) of Cedar Falls; a daughter, Diana (Todd) Kelley of Waterloo; two grandsons, Aidan and Landon Kelley; two brothers, David (Sue) Mueller of Madison, Wis., and John (Debbie) Mueller of Orland Park, Ill.; and a sister, Carol Byrne of Bourbonnais, Ill.
Preceded in death by her parents; and a brother-in-law, Ray Byrne. Services: 2 p.m. Saturday at First Congregational Church, with burial in Waterloo Cemetery. Public visitation 4 to 8 p.m. Friday at Hagarty-Waychoff-Grarup Funeral Service on West Ridgeway, and for an hour before services Saturday at the church. Memorials may be directed to First Congregational Church or American Cancer Society. Bonnie had a vibrant spirit and zest for life and loved her grandchildren.